Concrete stain in Chandler can add pizazz to the regular grey color of concrete flooring, protect it from Chandler, Arizona damage and wear, and jazz up the area to match just about any color or design you imagine. There are many types of stain, offering many types of looks and feels. Among the most popular are reactive and nonreactive stains. 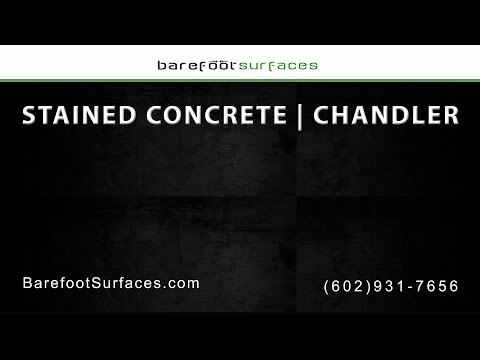 Barefoot Surfaces offers all types of concrete floor stains for garage remodels and Chandler epoxy floors. We believe it is important to take pride in your flooring and be able to enjoy it without shoes, which is why concrete floor staining is among the most tangible mission statement we can give our customers – taking pride in our work as a reflection of who we are. Staining your Chandler concrete floor can bring life to the area and is a great way to update existing flooring that may be outdated or damaged from wear and tear. Whether you choose acid stain, a water based stain, environmentally friendly stain or acrylic stain, they can all achieve a gorgeous and elegant concrete floor look and provide the look and finish that you strive for in your garage or home. Reactive stains are designed to react with a concrete surface chemically, therefore providing color or translucency that often resembles the variance of color that marble has. This attracting marbling effect is the reason many of our customers choose this type of Chandler concrete stain. If you are itching for the science behind the reaction…the acid based reactive concrete stain contains metallic salts that in turn react with the lime within the concrete base. After the chemical reaction takes place the concrete stain then forms a permanent bond and is virtually indestructible and will not chip away or erode. A fairly newer category of concrete stains are now water based stains and acrylic. Instead of relying on the chemical reaction between concrete lime and metallic salts these stains function similarly to paint to change the color of the concrete floor. Just like when you touch a paintbrush to canvas, the pigment is transferred to the surface of the canvas and this is how it the water based and acrylic stains work on concrete as well. Because they are not dependent on a chemical reaction, the color options are much more broad and provide customers with what feels like endless choices. Unlike the marble effect that reactive concrete stain provides, these color overlays are much more uniform and tend to appear slightly more opaque. Often we find that nonreactive stains are reported to be easier to apply, as the specific chemical reaction doesn’t need to be worried about. Some things to think about and ask (us). If you are considering concrete stain you must realize that the project you are getting yourself in to is permanent. Here are some guidelines, or at least good things to ask when thinking about the different types of concrete floor stain to choose from. Firstly, we suggest to test your chosen stain in an inconspicuous area to ensure the color and effect turns out the way you are hoping. Many companies will provide you with samples of the products you are potentially buying. Depending on what type of concrete floor stain you are choosing to go with, results can vary. Having an idea of what you want your concrete floor to ultimately look like can help you or Barefoot Surfaces understand how to proceed. Just like artists use different combinations of color and mediums to produce a desired result, the same goes for staining your Chandler concrete floor. We are sure you have questions about what to do next, so hopefully this will help urge you in the right direction. Will the condition of my preexisting concrete floor matter? Yes – to some extent. Grease stains, dirt and damage can all affect how the stain sits and adheres once applied. The best option is to have Barefoot Surfaces come take a look at the condition so that we can make the best choice in concrete stain that will give you your desired results. Can it be used indoor and outdoor? Short answer – yes. Both acid and water based stains are sealed and protected and can be used in both exterior and interior settings. Some color can fade with direct sunlight, but there are plenty of measures that can be taken to make sure that your new Chandler concrete flooring will look amazing for years to come. Are there special tools that are needed? We suggest letting a professional assess the situation. It is hard to tell what you will need until we find out what the condition of the concrete is, how vibrant you want the color and where your concrete flooring is. How long does it take before we can walk/park/play on it? Chemical concrete stains take longer to dry than nonreactive, typically at least five hours before the stain can be rinsed and the sealer can be applied. Water based concrete floor stains dry much quicker, most of the time within a couple of hours. Concrete dye doesn’t take nearly as long, drying within just a few minutes. We would say that it is always best just to delegate these big jobs to someone that knows exactly what they are doing and that can guarantee a quality job without the stress and hassle of hoping you are doing it right. For a variety of flooring services including patio epoxy flooring in Chandler, call Barefoot Surfaces today!